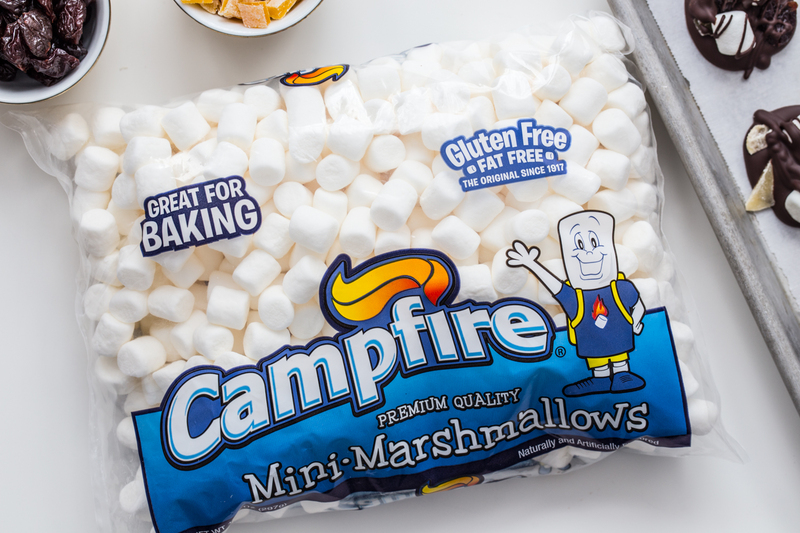 This post is sponsored by Campfire® Marshmallows. All opinions are my own. Happy February! Yes, I’m pinching myself because how in the world can we already be a month into 2017?! However it happened, it’s here, and I’m looking forward to celebrating the holiday of love: Valentine’s Day! 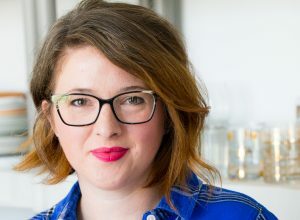 I think we could all use a little extra love and kindness in our lives these days so today I am sharing a super quick recipe for chocolate marshmallow fruit candy that can be packaged up into sweet little wrappings and passed out to your friends, co-workers, classmates, or even strangers on the street. 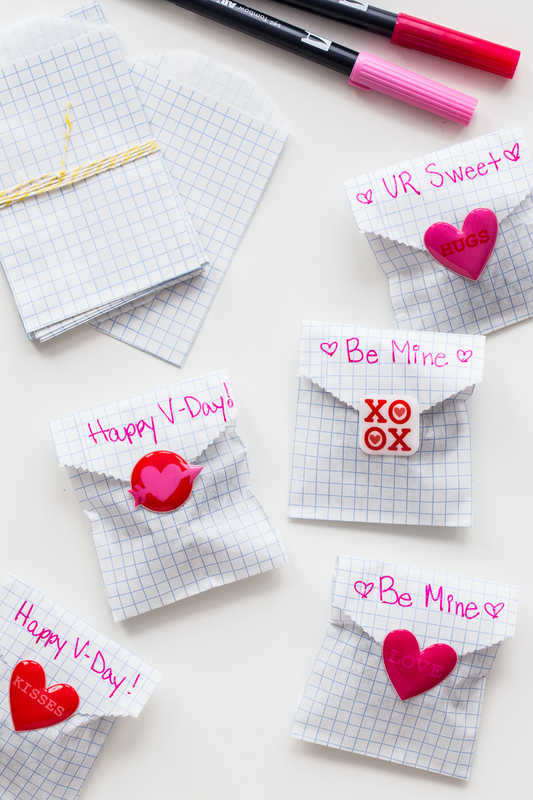 I for one have not outgrown the love of a Valentine I think even your grown-up friends will appreciate a bit of sweetness. 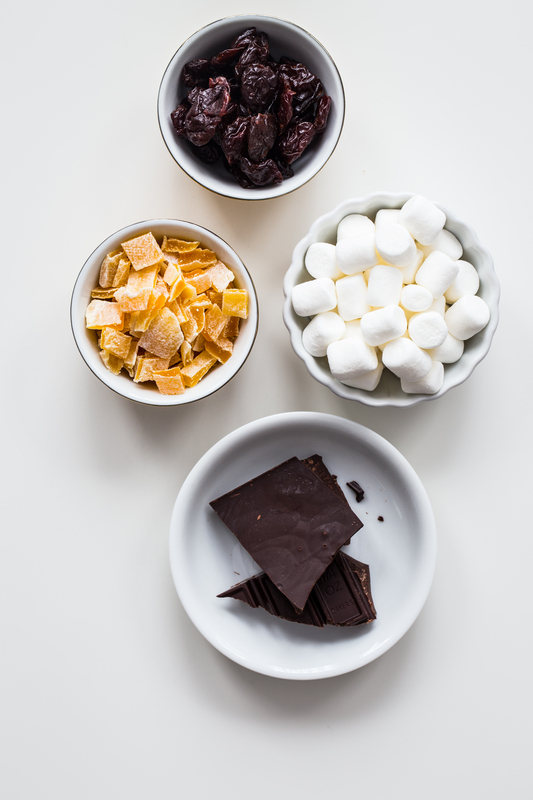 These candies are crazy easy to make and take just 3 ingredients: chocolate, Campfire® mini white marshmallows, and dried fruit. I used dried tart cherries and diced dried mango for the fruit, but you can use your favorites. The marshmallows add a touch of softness and sweetness which is just right paired with the semi-sweet chocolate. These candies are the perfect size to package up and give to friends. 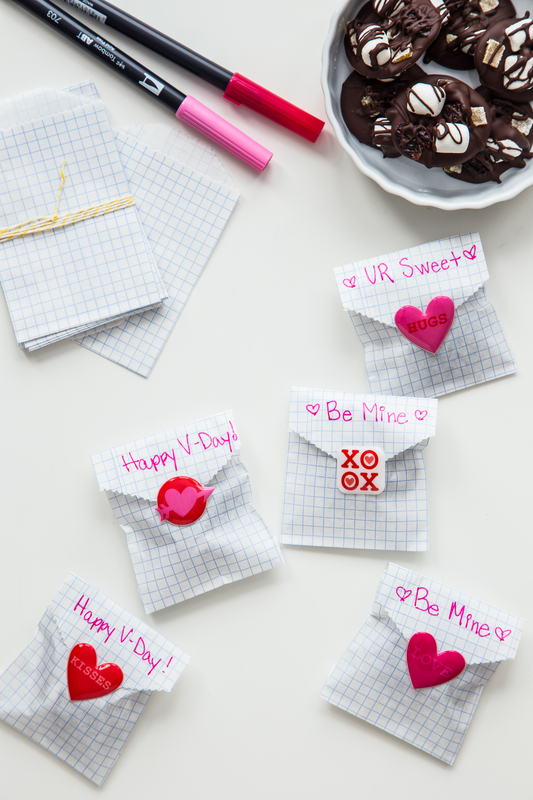 I am crushing hard on these little graph paper pouches I found on Etsy that are awesome for a school Valentine’s treat. 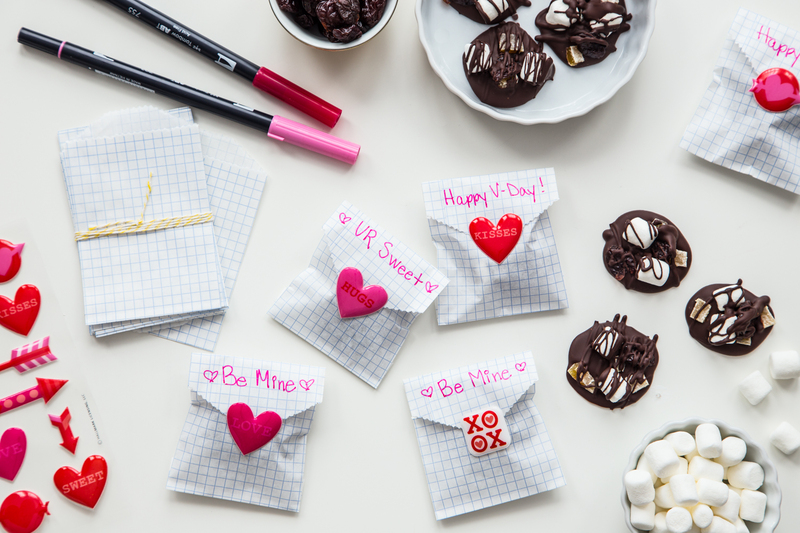 The packages can be personalized with little notes and stickers and of course, 1 sweet chocolate marshmallow fruit candy! 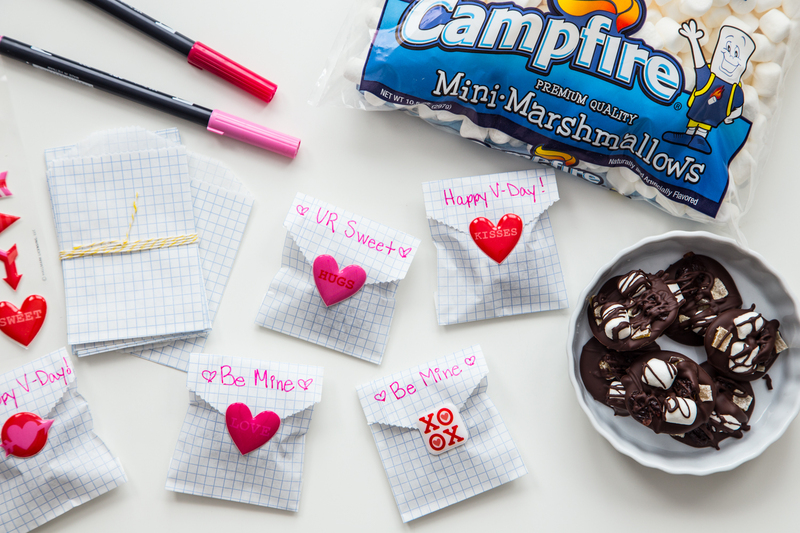 Be sure to check out Campfire® Marshmallows for more Valentine’s Day ideas. 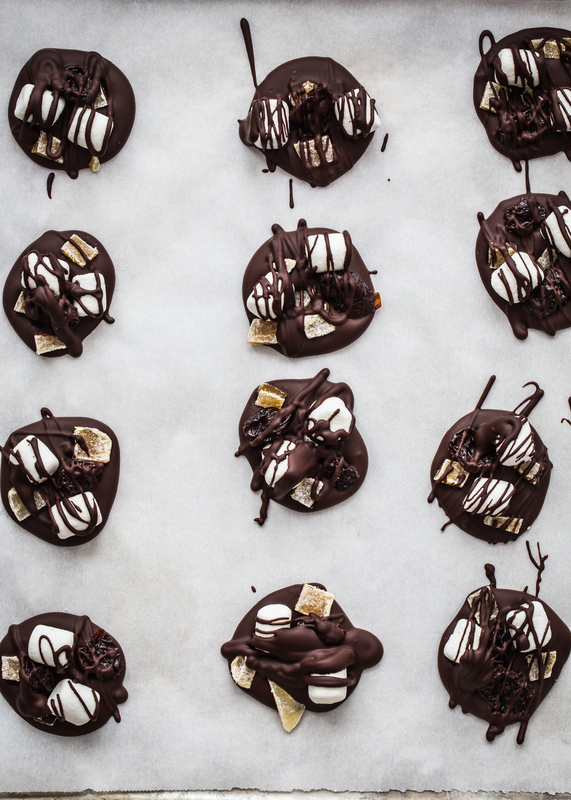 Our Marshmallow Madness Pinterest board is packed full of awesome marshmallow-y goodness like Chocolate Pretzel Cereal Treats and Fruity Mallow Cups! Line a baking sheet with parchment paper. Drop 1-2 teaspoons of chocolate into a small circle onto the parchment paper. Place 2 mini marshmallows and a few mango pieces and dried tart cherries on each chocolate circle. Drizzle with a small amount of chocolate. Repeat for remaining chocolates. Allow chocolates to sit at room temperature until chocolate is set. Store candies in an air tight container in a cool space for 3-4 days. I can’t wait to try this. My mouth started salivating by seeing this only. Cookies are my favorite and any type of chocolates is great for me. I love to try different types of chocolates and this is kind of different one which I haven’t tried yet. So I’m definitely going to try this soon and will definitely let you know, how it turned out. I never regretted any moment that came to your blog! It’s amazing and Definitely, I will try it at home, if you want to tell me how can I make things better and better, it would show and help you a lot.